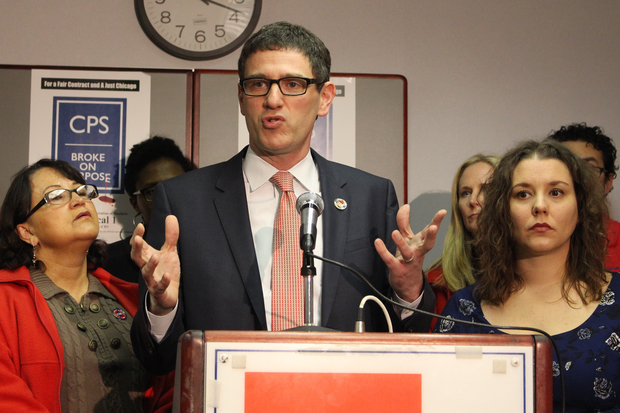 "We don&apos;t want to strike," insisted Chicago Teachers Union Vice President Jesse Sharkey. RIVER NORTH — More than 96 percent of teachers who voted last week support a strike, the Chicago Teachers Union said Monday in releasing results. "We don't want a strike," insisted union Vice President Jesse Sharkey, but he said, "Our members will not go to work if we have to." Sharkey accused Chicago Public Schools of dragging its feet in the process to be followed before a strike can be called, but said a walkout in late March or early April was possible. Sharkey said the district and state and local politicians were playing "a funny kind of a blame game" in pleading for public patience and additional funding. "Politicians need to stop pointing fingers at one another and start taking some responsibility for fixing the problem," Sharkey said. Chicago Teachers Union President Karen Lewis has threatened a strike as soon as legally possible. Yet he added that the union intended to press the initiative, especially given the weakened state of Mayor Rahm Emanuel given fallout from the Laquan McDonald case and calls for his resignation. "The Emanuel administration has a crisis of legitimacy on its hands," Sharkey said, adding that the mayor can't "politically afford" a strike at this point. "Rahm Emanuel really doesn't need a teachers' strike. He really doesn't," Sharkey said. "And what we're telling him is, if he doesn't listen to us, that is what he'll get." CPS Chief Executive Officer Forrest Claypool argued that a strike is not in the best interests of students or the district. "Making sure that our children are learning remains our highest priority," Claypool said. "We have the highest respect for our teachers' work and, while we understand their frustrations, a strike that threatens to set back our students’ progress is simply not the answer to our challenges." Claypool said any solution to the estimated $1.1 billion deficit CPS faces "must begin with Springfield. CPS students receive only 15 percent of the state’s education funding, despite being 20 percent of the state’s enrollment. So rather than strike, we ask that the Chicago Teachers Union join us to fight for our shared goal of equal education funding from Springfield for Chicago’s children." Emanuel echoed that in a statement issued by his press office. "Chicago’s children are making educational gains that outpace the trends in Illinois and around the country, and Mayor Emanuel is committed to doing everything he can to help our students and teachers build on that progress," said mayoral spokeswoman Kelley Quinn. "As he has said many times, the mayor finds the idea of cuts to our schools unconscionable, and he hopes that CTU will join the city and CPS in demanding a funding system that will treat our children fairly and secure our teachers’ futures." Sharkey said Monday the district can't "solve the present problems on the backs of educators" and called for new forms of revenue to address the deficit, adding, "Cutting would be devastating." Sharkey charged that the district was attempting to slow the process leading to a possible strike. As negotiations for a new contract continue, he said the union is calling for formal "fact-finding" in talks, and has filed a complaint with the Labor Relations Board to begin the process after three and a half months of mediation. "Fact-finding hasn't even begun yet," Sharkey said. If fact-finding were to begin soon, he said, that hurdle, which calls for at least 105 days of consideration, could be leapt in time for a strike to begin in late March. Yet, according to Sharkey, the Board of Education "has different ideas and is trying to drag its feet" so that fact-finding would begin in February, which would potentially put off a strike until May or June — or the start of the school year next fall, if the union were to decide on that course. 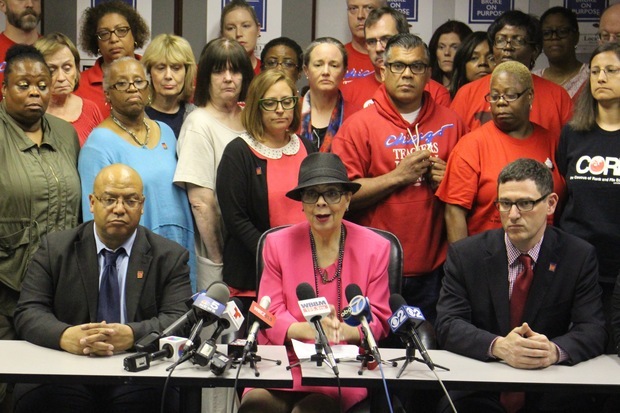 "We will continue to negotiate in good faith with the CTU leadership to reach a fair, multi-year agreement that protects teachers, their jobs and ensures our students’ success," Claypool said. The Chicago Teachers Union released the results of its strike vote at a Monday news conference at its headquarters in the Merchandise Mart. Of 22,678 votes, 21,782 teachers voted "yes" to authorize a strike if the city and the union can't come to an agreement on a contract. With 91.6 percent of the union's 24,752 members voting over three days last week, that means 88 percent of the membership voted to authorize a strike, easily above the three-quarters threshold required by state labor law. The union and Chicago Public Schools have been basically rattling sabers for months, even as both sides have been engaged in talks over a new contract. Claypool has threatened 5,000 layoffs before the second semester if the General Assembly does not give the district an extra $480 million that has been budgeted, but not allocated. As contract talks between the two sides have continued, the union has countered by threatening a strike as soon as legal hurdles are cleared, perhaps as early as March. "We're not going to take this lying down," Sharkey said.